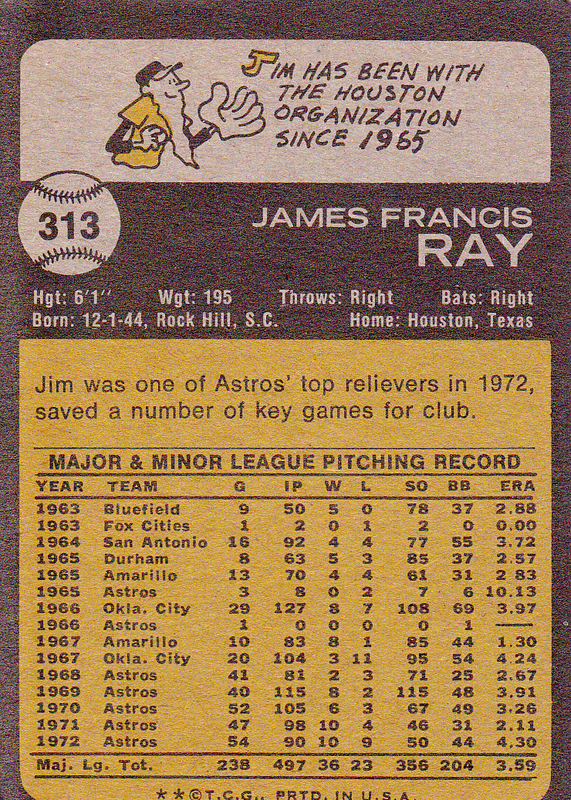 James Francis Ray (born December 1, 1944 in Rock Hill, South Carolina), is a retired American professional baseball player, a right-handed pitcher in the Major Leagues from 1965–1966 and 1968–1974 for the Houston Astros and Detroit Tigers. 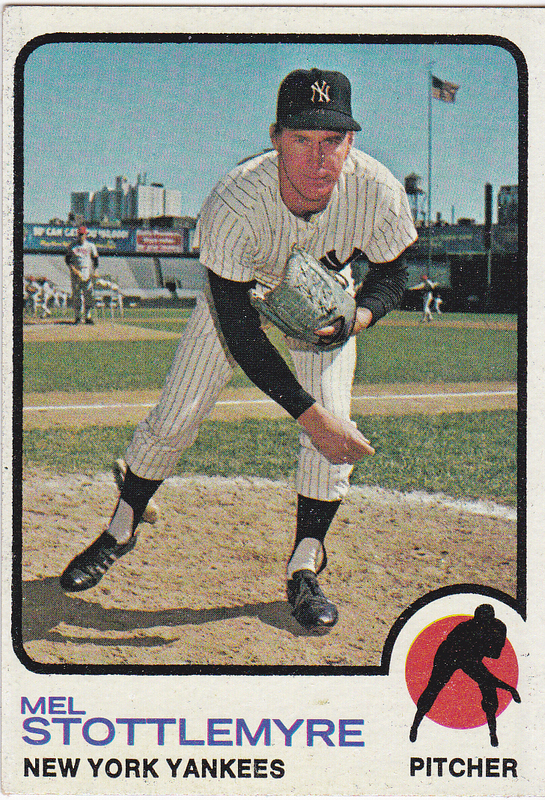 Ray was known as a hard thrower with a stellar fastball and earned the nickname “Ray Gun” during the 1969 season when he struck out 115 batters in 115 innings. 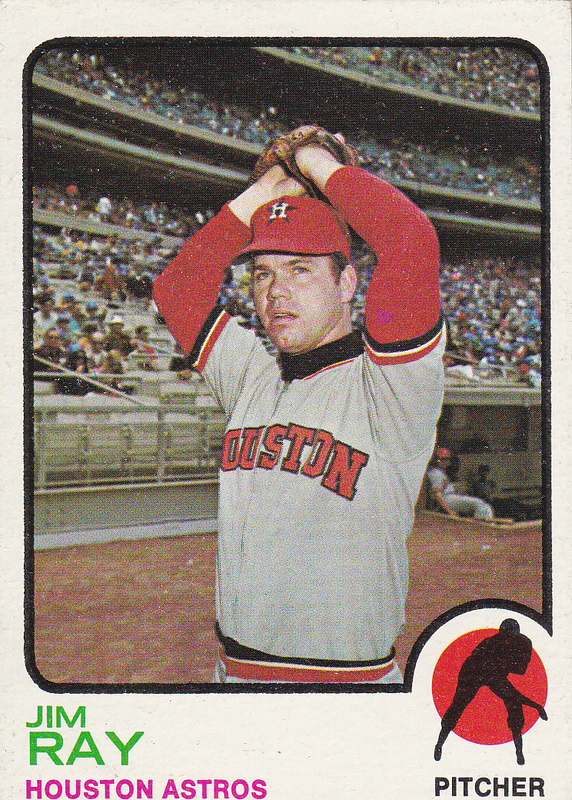 Two years later, he appeared in 47 games played for the 1971 Astros, all but one in relief, and won ten of 14 decisions with a 2.12 earned run average. Ray appeared in 308 Major League games, all but 20 in relief, and notched 25 saves. Cazzie Lee Russell (born June 7, 1944 in Chicago, Illinois) is a former pro basketball player and coach. In 1962, Russell was named the Chicago Sun Times Boy’s Player of the Year. Russell played college basketball at the University of Michigan, where he led the Wolverines to three consecutive Big Ten Conference titles (1964–66) and to Final Four appearances in 1964 and 1965, losing in the final game 91-80 to defending national champion UCLA and John Wooden. In 1966, Russell averaged 30.8 points per game and was named the College Basketball Player of the Year. Crisler Arena, which opened in 1967, has been dubbed The House that Cazzie Built. Russell spent twelve seasons in the NBA (1966-1978), and his best remembered for his five seasons with the New York Knicks (1966-71). Russell was the NBA’s first draft pick in 1966, and was named to the 1967 All-Rookie Team. He was later part of the famous 1970 Knicks team that won the NBA championship over the Los Angeles Lakers. Russell played in the 1972 NBA All-Star Game while with the Golden State Warriors. When he played for the Lakers, he was the last player to wear #32 prior to Magic Johnson. Russell was the head coach of the men’s basketball team at the Savannah College of Art and Design for 13 seasons, until the college eliminated the sport in 2009. He still remains at the college in an administrative capacity. Posted in '72-'73 Topps, Basketball, Forward, Golden State Warriors. Bookmark the permalink. 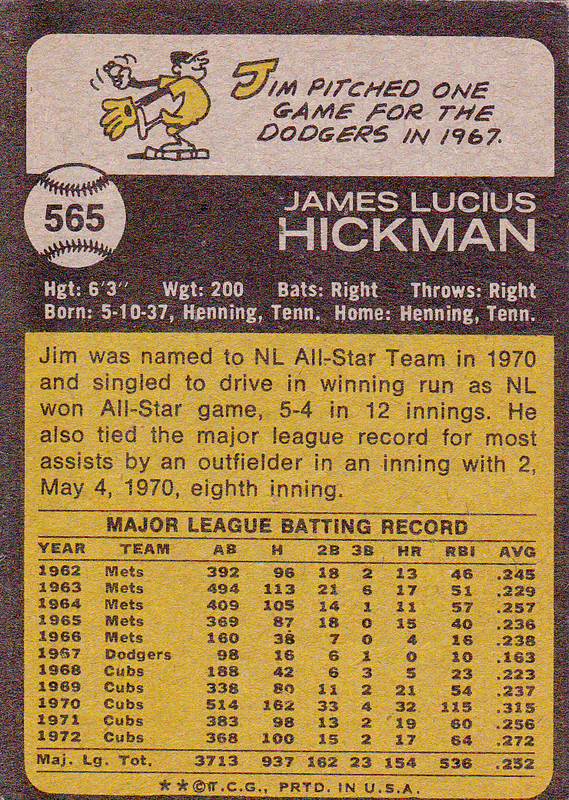 James Lucius Hickman (born May 10, 1937 in Henning, Tennessee) is a former Major League Baseball player. Hickman was signed by the St. Louis Cardinals as an amateur free agent prior to the 1956 season. He spent six seasons in the Cardinals’ farm system until he was selected by the New York Mets in the expansion draft. In his five seasons with the Mets, with whom he played 624 games, Hickman batted .241 with 60 home runs with 210 RBI. 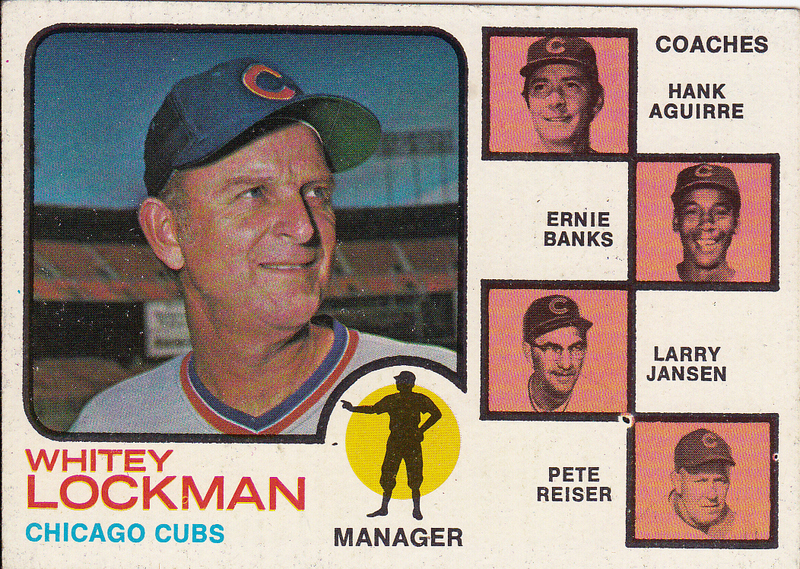 The best season of Hickman’s career was 1970 while with the Cubs. After playing in only 198 games from 1966-1968 and batting only .237 in 1969, he hit .315 with 162 hits, 33 doubles, 32 home runs, 115 runs batted in, 102 runs scored and 93 walks—all career highs which won him the National League Comeback Player of the Year Award and placed him 8th in the NL Most Valuable Player balloting. He also made his only All-Star appearance at the Cincinnati Reds’ newly opened Riverfront Stadium where, in the 12th inning, his RBI single drove in hometown favorite Pete Rose for the winning run, Rose barreling over Cleveland Indian catcher Ray Fosse to score the run. Like Hickman, the pitchers of record were also Tennessee natives: Claude Osteen, Hickman’s Dodger teammate in 1967, was the winning pitcher, while Hickman collected the walk-off single off Clyde Wright—his eventual 1970 American League Comeback Player of the Year counterpart. In his 13-year career, Hickman batted .252 with 159 home runs and 560 RBIs in 1421 games played. 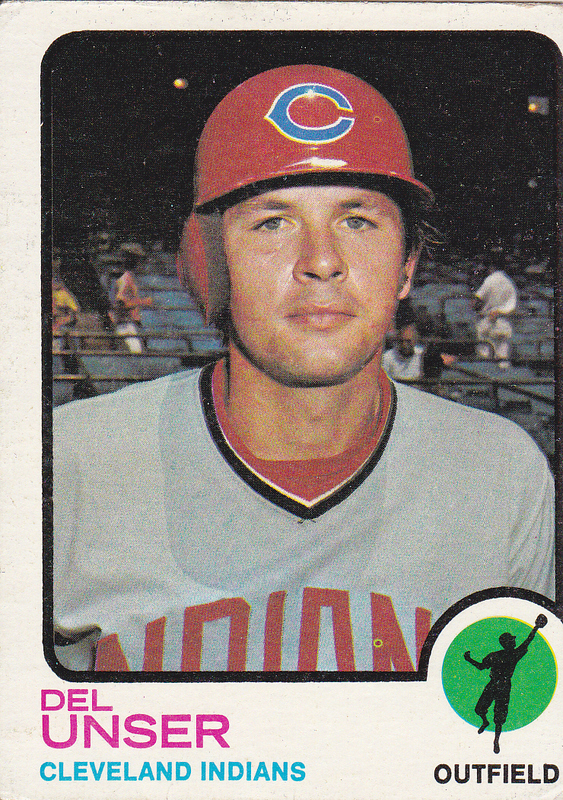 Posted in 1972 Topps, 1973, 1973 Topps, 1st Base, Chicago Cubs, Cubs, Outfield. Bookmark the permalink. 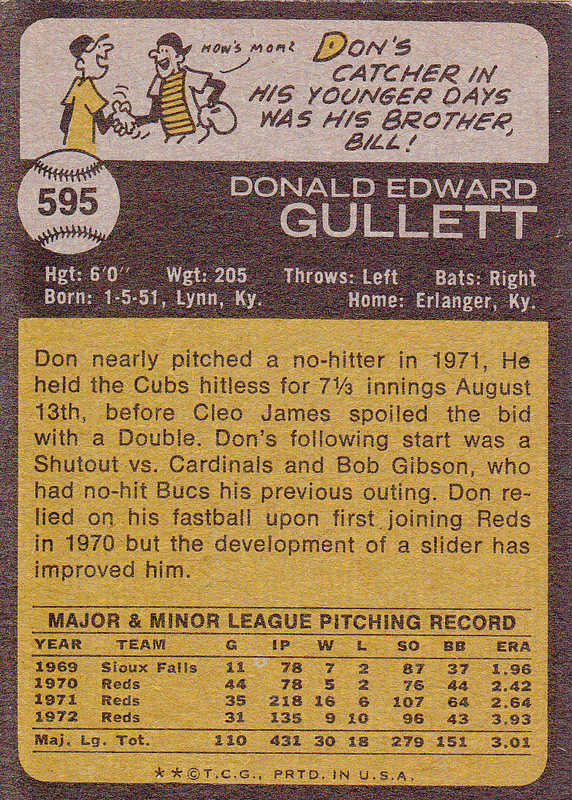 Donald Edward “Don” Gullett (born January 6, 1951 in Lynn, Kentucky) is a former Major League Baseball pitcher who played for the Cincinnati Reds and New York Yankees from 1970 to 1978. He also served as pitching coach for the Cincinnati Reds from 1993 to 2005. Gullett played for the Reds from 1970 through the 1976 season. In November of that year, as a free agent, he signed with the New York Yankees. He enjoyed a successful 14-4 season with the Yankees in 1977, but shoulder problems in 1978 signalled the end of his career. During a relatively brief nine year career, Gullett accumulated 109 wins and posted an impressive 3.11 Earned Run Average. Playing for only nine seasons, Gullett was a member of six World Series teams (1970, 72, 75, 76, 77, 78), including four consecutive World Champions (’75 and ’76 Reds, and ’77 and ’78 Yankees). At the plate, Don Gullett posted a respectable (for a pitcher) career batting average of .194. 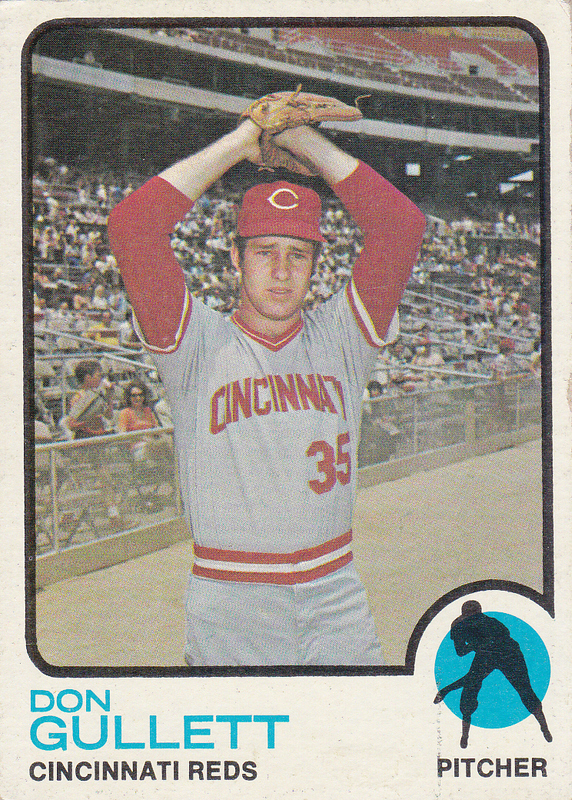 For example, in a 1975 National League Championship Series game against the Pittsburgh Pirates, Gullett not only pitched a complete game victory, he also helped himself out by hitting a single, a home run, and collecting 3 RBI. I n 1993, he rejoined the Reds as pitching coach, a post he held until being ousted mid-season in 2005. The Cincinnati Reds Tuesday fired manager Dave Miley and pitching coach Don Gullet, replacing them with Jerry Narron and Vern Ruhle. The Reds have the second-worst record in the National League at 27-43, 18 1/2 games behind the St. Louis Cardinals. Miley, who spent 26 years in the Reds organization, posted a 125-164 record as manager since taking over for Bob Boone in 2003. Gullett had been pitching coach since 1993. William Curry “Billy” Keller (born August 30, 1947 in Indianapolis, Indiana) is an American former professional basketball player. The 5’10” guard, spent his entire basketball career in the state of Indiana. He attended George Washington Community High School, located in Indianapolis, Indiana. He was named Indiana’s Mr. Basketball his Senior year. Billy was the 2nd pick in the 7th round in the 1969 NBA Draft to the Milwaukee Bucks, but only played for the ABA’s Indiana Pacers. Along with the likes of George McGinnis and college teammate Rick Mount, he helped lead the Pacers to three ABA Championships in ’70, ’72 and ’73. Keller would become one of the most successful shooters in ABA history, making 506 three-point field goals during his seven-year career while leading the league in free throw percentage two times in 1973 and 1976. He set an ABA Playoffs record going 30-30 from the free throw line in the 1974-1975 season. He finished his 7 year ABA career averaging 11.8 points a game, with a .456 field goal percentage and scoring a total of 6,588 points. Four years after his career in the ABA, Bill served as an assistant coach at his alma mater in 1980 under second year head coach, Lee Rose. He helped lead Purdue to an overall record of 23-10, including an NCAA Final Four appearance. In 1992, Keller was elected to the Indiana Basketball Hall of Fame. He currently runs a series of basketball camps in his home state. Posted in '72-'73 Topps, Basketball, Guard, Indians Pacers and tagged '72-'73 Topps, Guard, Indiana Pacers. Bookmark the permalink. 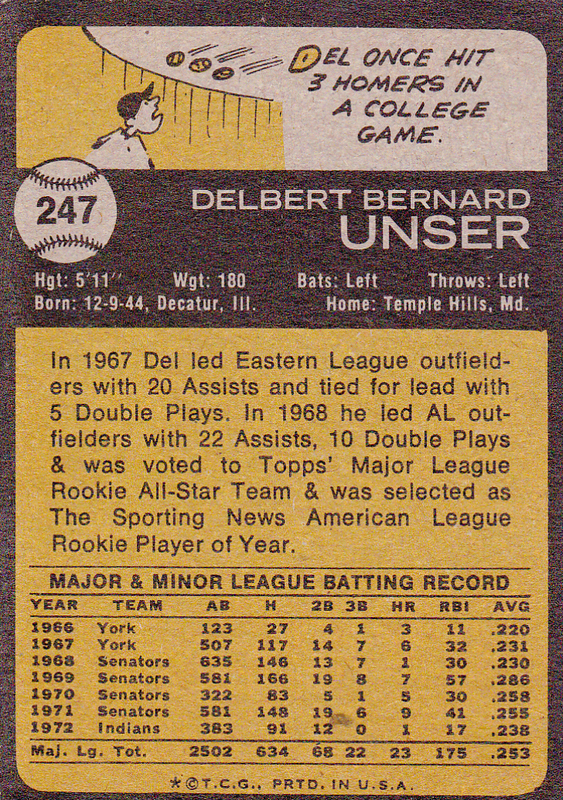 Delbert Bernard Unser (born December 9, 1944 in Decatur, Illinois) is a retired center fielder and utility player who had a 15-year career from 1968 to 1982. Unser played for the Washington Senators from 1968 to 1971 and the Cleveland Indians in 1972. He also played for the Philadelphia Phillies from 1973 to 1974, the New York Mets from 1975 to 1976, the Montreal Expos from 1976 to 1978, and again for the Phillies from 1979 to 1982. In 1977 he began to be used primarily as a pinch-hitter, and also split his time on the field between the outfield and first base. 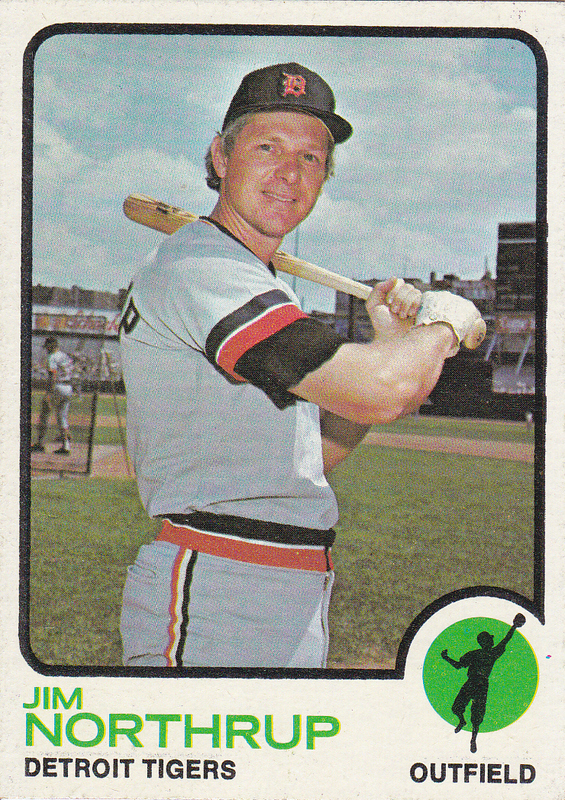 Unser led the American League in triples in 1969 with eight. 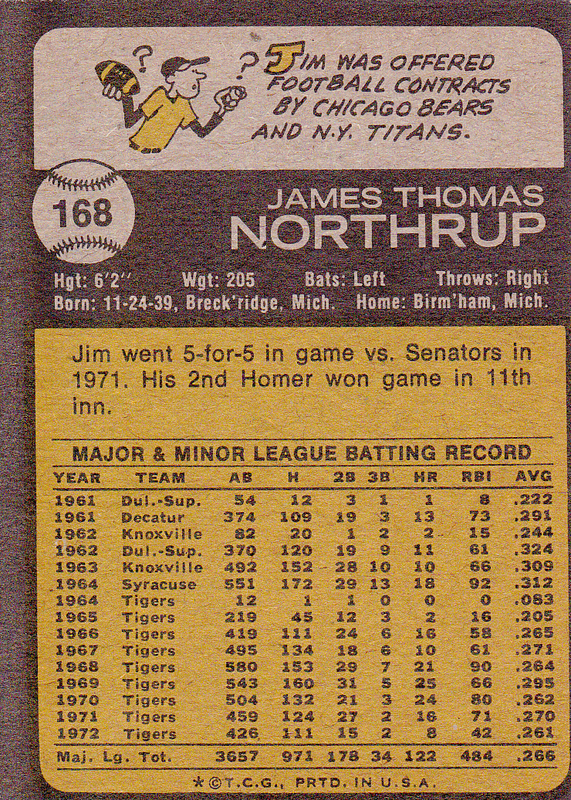 He had one 5-hit game, in which he hit four singles and a home run against the Oakland Athletics on August 20, 1968. Unser’s career totals include 1,799 games played, 1,334 hits, 87 home runs, 481 Runs batted in, and a lifetime batting average of .258. Unser, along with Lee Lacy, is one of two players to hit three pinch-hit home runs in consecutive at-bats. Currently, Unser is a scout for the Phillies. His father is retired MLB catcher Al Unser. Posted in 1973, 1973 Topps, Cleveland Indians, Indians, Outfield and tagged 1973, 1973 Topps, Cleveland Indians, Indians, Outfield. Bookmark the permalink. 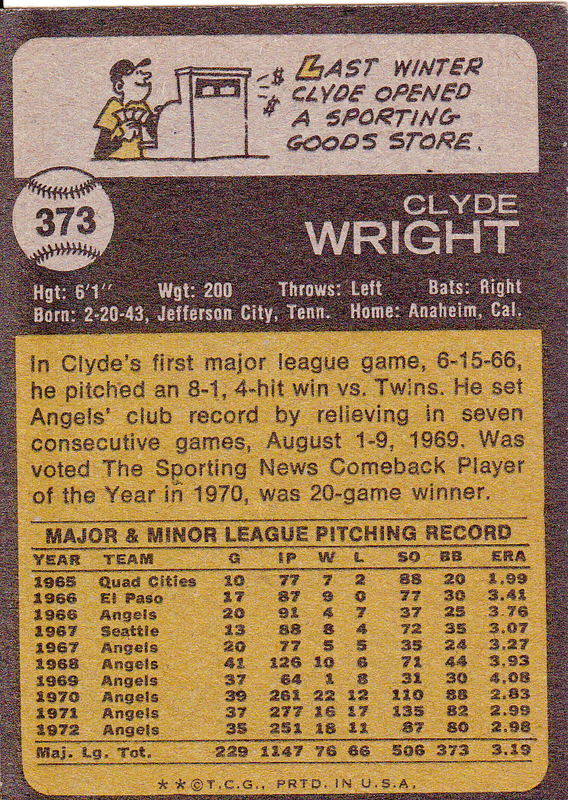 Clyde Wright (born February 20, 1941 in Jefferson City, Tennessee), He pitched for the California Angels (1966–73), Milwaukee Brewers (1974) and Texas Rangers (1975). He also pitched three seasons in Japan for the Yomiuri Giants (1976–78). He is the father of Jaret Wright. Wright was a star pitcher at Carson-Newman College, whom he pitched to the 1965 NAIA Baseball World Series title. During that World Series, Wright struck out 22 batters in one game, an NAIA World Series record. Wright defeated the Minnesota Twins on a four-hitter in his Major League debut (June 15, 1966). He was a spot starter for the Angels in his first two seasons, and in 1968 won 10 games while losing six, pitching mostly in relief. In 1970 he had the best season of his career. He won 22 games to become only the second 20-game winner in franchise history and established a career-low 2.83 ERA, which earned him the American League Comeback Player of the Year Award. Wright also no-hit the Oakland Athletics 4-0 at Anaheim Stadium on July 3 of that year, the first no-hitter ever pitched in that stadium. 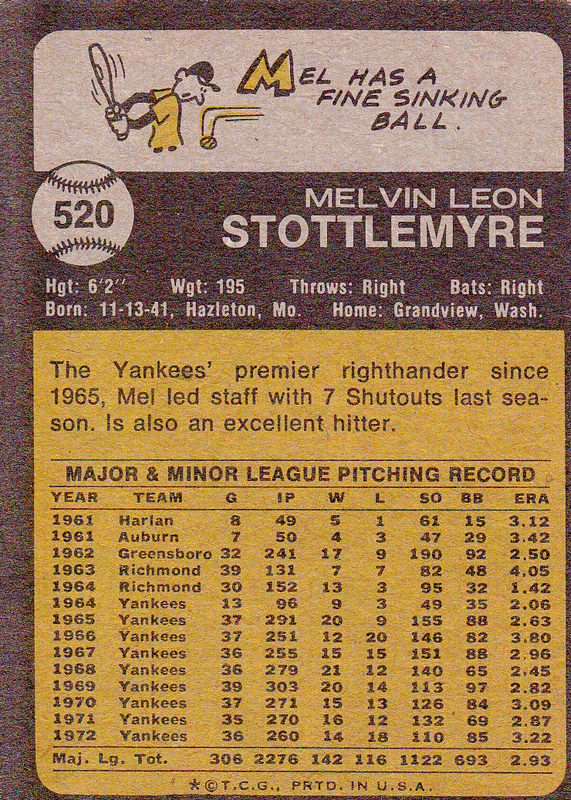 He almost lost the no-hitter in the 7th inning on Reggie Jackson’s 400-foot shot to straight-away center field, which was caught by Jay Johnstone just in front of the wall. The day was doubly memorable for Wright: in a pre-game ceremony, he had been inducted into the NAIA Hall of Fame. During a 13-year baseball career, Wright won 100 games, 667 strikeouts, and a 3.50 earned run average. 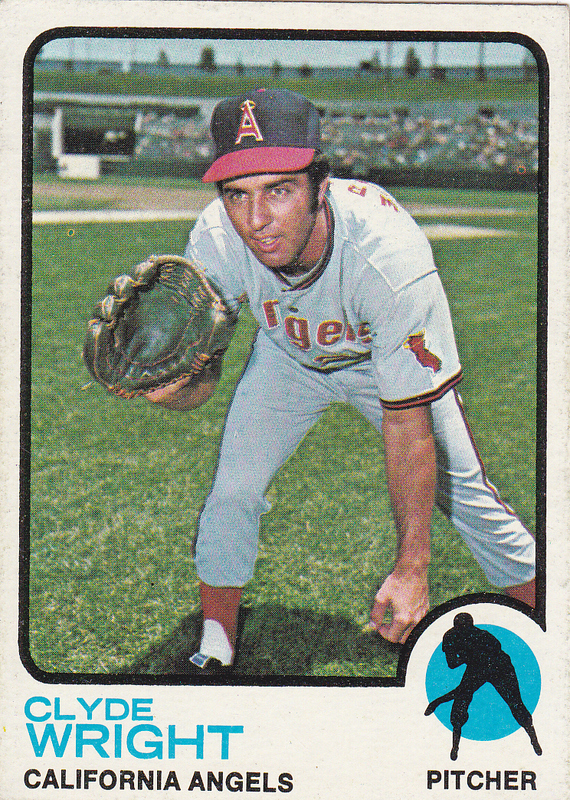 Posted in 1973, 1973 Topps, Angel's, California Angels, Pitcher and tagged 1973, 1973 Topps, Angles, California Angels, Pitcher. Bookmark the permalink. Carl Walter “Whitey” Lockman (July 25, 1926 – March 17, 2009) was a player, coach, manager and front office executive in American Major League Baseball. On October 3, 1951, Lockman scored the tying run, just ahead of Bobby Thomson, on Thomson’s home run that gave the New York Giants the National League championship – baseball’s “Shot Heard ‘Round the World.” Lockman’s one-out double against the Brooklyn Dodgers had scored Alvin Dark with the Giants’ first run of the inning, and made the score 4–2, Brooklyn. His hit knocked Dodger pitcher Don Newcombe out of the game, and, on the play, Giant baserunner Don Mueller injured his ankle sliding into third base. While Mueller was being carried off the field to be replaced by a pinch runner, Dodger manager Chuck Dressen called on relief pitcher Ralph Branca, whose second pitch was hit by Thomson into the Polo Grounds’ lower left field stands for a game-winning, three-run homer. Lockman’s coaching career began immediately after his playing days ended, as he joined the Reds’ staff in 1960 under skipper Fred Hutchinson. In 1961, when his old teammate Dark became manager of the Giants, Lockman became his third base coach, serving through 1964. 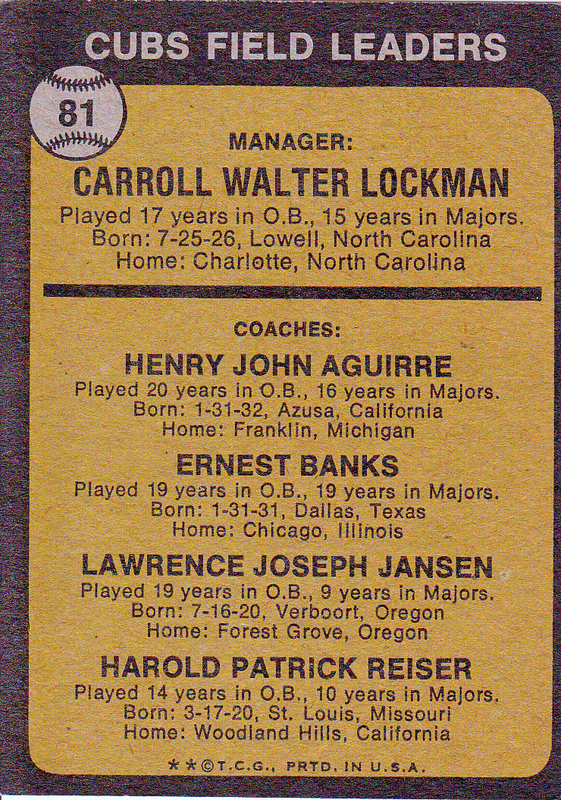 Lockman then joined the Chicago Cubs as a minor league manager, coach, and, then, Director of Player Development. In July 1972, he succeeded his old mentor, Leo Durocher, as Cubs’ manager and the revitalized Cubbies won 39 of 65 games to improve two places in the standings. But losing marks in 1973 and into 1974 cost Lockman his job; he was relieved of his duties July 24, 1974 and moved back into the Chicago front office, serving as General Manager from late 1973 to late 1975. Lockman later was a player development official and special assignment scout for the Montreal Expos and Florida Marlins. Lockman finished with a career major league managing record of 157–162 (.492). 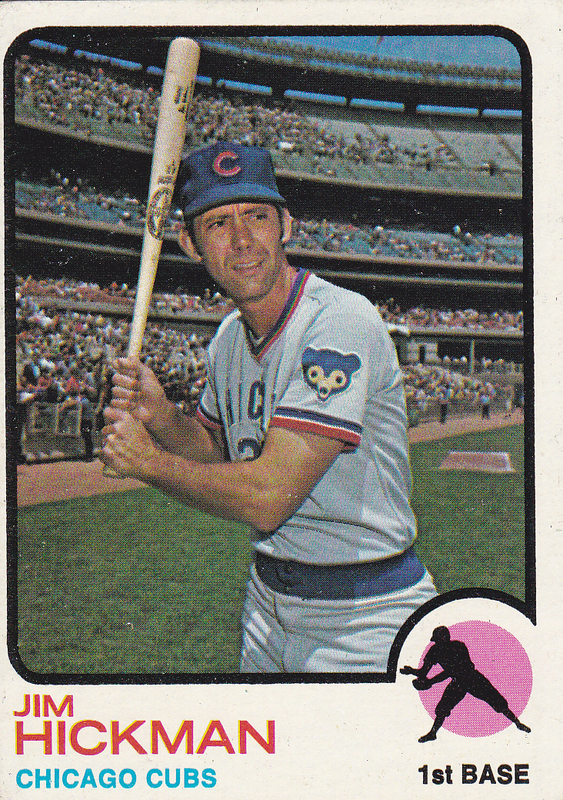 Posted in 1973, 1973 Topps, Chicago Cubs, Cubs, Manager and tagged 1973, 1973 Topps, Chicago Cubs, Cubs, Manager. Bookmark the permalink.